Cumulus Media is very proud to partner with the Ronald McDonald House. Today, one local Credit Union gave them a big surprise. Azura Credit Union raised money for the local charity thru a program called “Skip-A-Pay”. 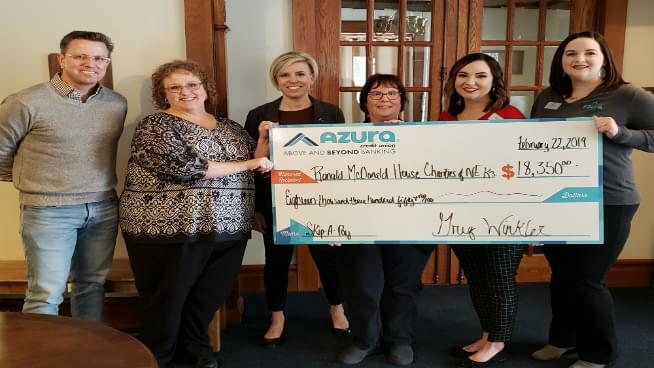 At the Ronald McDonald House, representatives from the Credit Union presented CEO/Executive Director Mindy Reese with a nice donation. We were there for the check presentation. Last year, 166 families stayed at the Ronald McDonald House, which equals to 1,573 nights. The best part of the charity is that no family who has to stay there is obligated to pay for housing, food and laundry services. This is the first time the organization has received donations from Azura.